So many of you asked for a dessert recipe to serve around the holidays, many for a variation of Pecan Pie, so what better dessert recipe than Pecan Pie Brownies? 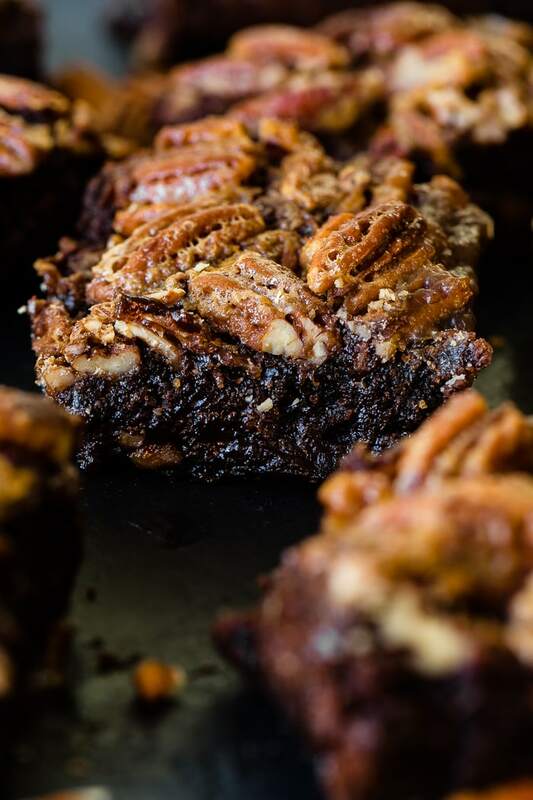 Pecan Pie Brownies are like a mix of your favorites, a delicious pie and those fudgy brownies, but while it’s a super easy recipe to make it can also cause some major issues. This is one of those recipes where we prefer to bust out a shortcut with the brownies, but you must follow everything to a T or you’ll end up with gooey brownies, and not in the way you’re thinking. It’s a real mess to be scooping brownies out of a pan using a large metal spoon instead of carefully cutting those perfect lines and going in for your favorite piece. Years ago I posted this picture of brownies and asked the age old question, Do You Prefer Edge or Middle? I was actually a little surprised by how close the count was. Almost split evenly for both! Can you guess what we prefer? Cade is a pretty die-hard middle man which I was as well until the last two years. Suddenly I’ve been really pulled to the edge. 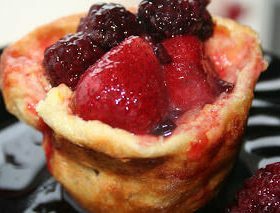 I just love that it’s got both the soft and fudgy middle along with the crisp and chewy edges. I should restate that because crisp really shouldn’t be included. Chewy. I don’t like burnt edges on brownies. Chewy are awesome, burnt chocolate is never my favorite. We have yet to post a classic Pecan Pie recipe, so I do apologize that isn’t on our site yet, but hear me out. I’ve never really had Pecan Pie. Like really at all. 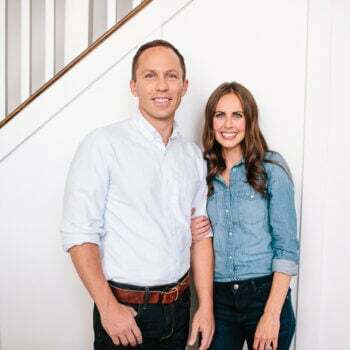 That means that I have to do a heck of a lot of research in order to figure it all out, and I’m willing, for sure, but Cade is a southern boy and I need him weighing in on all things so it’s taking a bit longer. In fact, if one of you has the most amazing Pecan Pie recipe we would love to try it out! Pecan Pie needs one really important thing, pecans. Obviously. That was exhausting to say, but it’s true. Start out with good Pecans and then make a brown sugar mixture that you’ll fold the nuts into. This is really important, so pay very close attention. After mixing the pecans and the brown sugar all together you’ll spread the mixture on top of the brownies, but too much of the liquid will keep the brownies soggy no matter how much you cook them, so listen, you have to mix the nuts well, but be willing to not add every last bit of liquid to the brownies. Like really, don’t. I don’t like to waste either, but just do it. 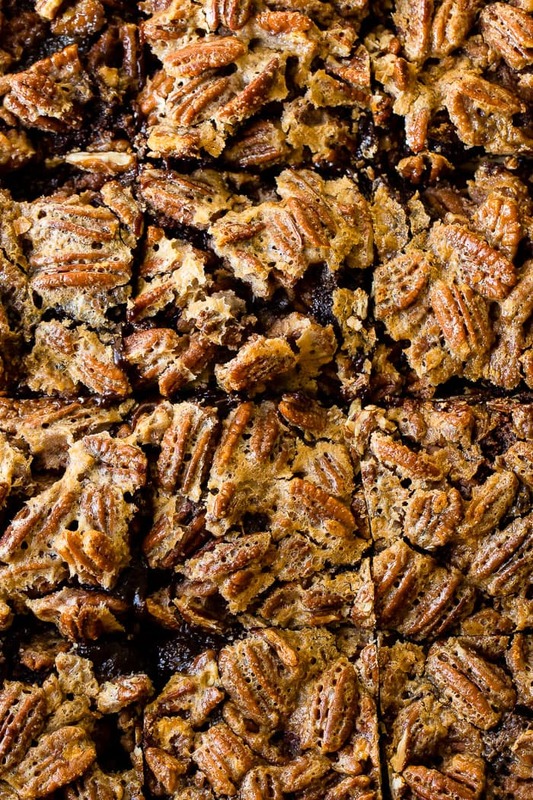 While we are waiting on that pecan pie recipe, we do feel confident in these chewy, crunchy, brown sugar lovin’ Pecan Pie Brownies. 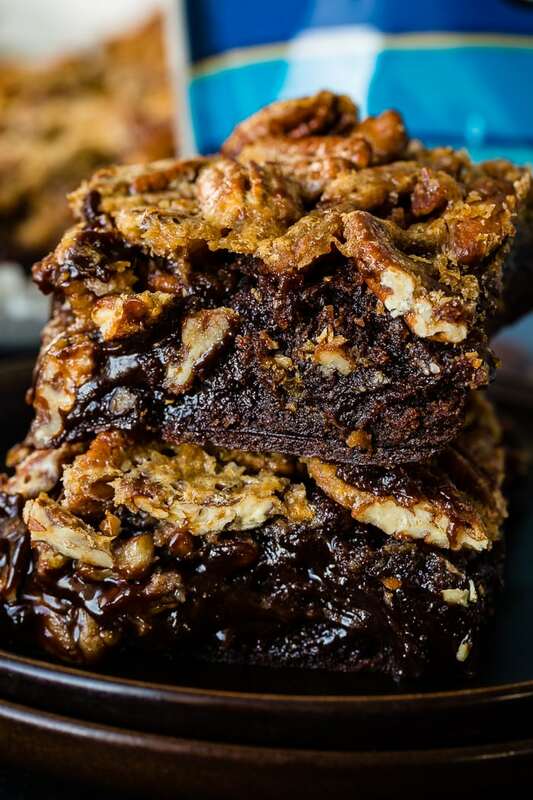 If you need a from scratch brownie base we recommend trying out our blender brownies, pictured above. Ina Garten’s Brownies are pretty dang amazing as well. 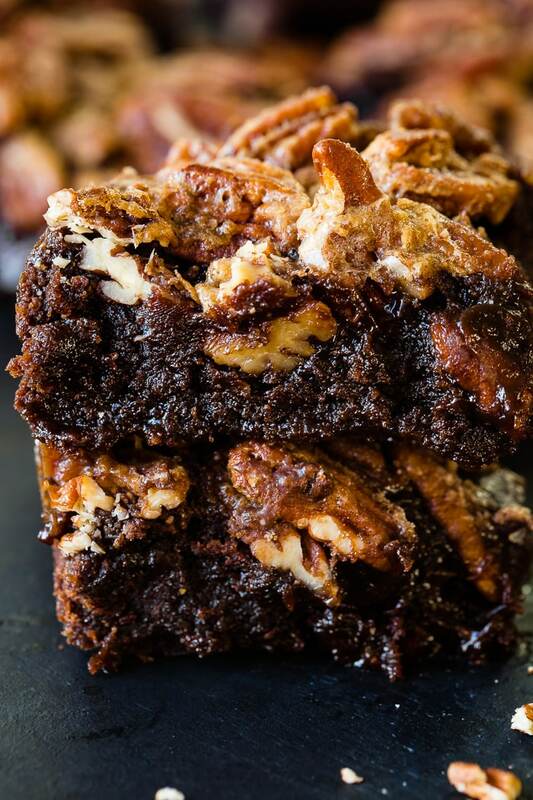 Can You Freeze Pecan Pie Brownies? Pecan pie brownies are easy to freeze pecan pie brownies. Just make sure that everything is absolutely cool before you even attempt anything. Then, take the brownies and place them on plastic wrap in a single layer and wrap them multiple times. Store the brownies in two sections gallon sized ziploc bags. 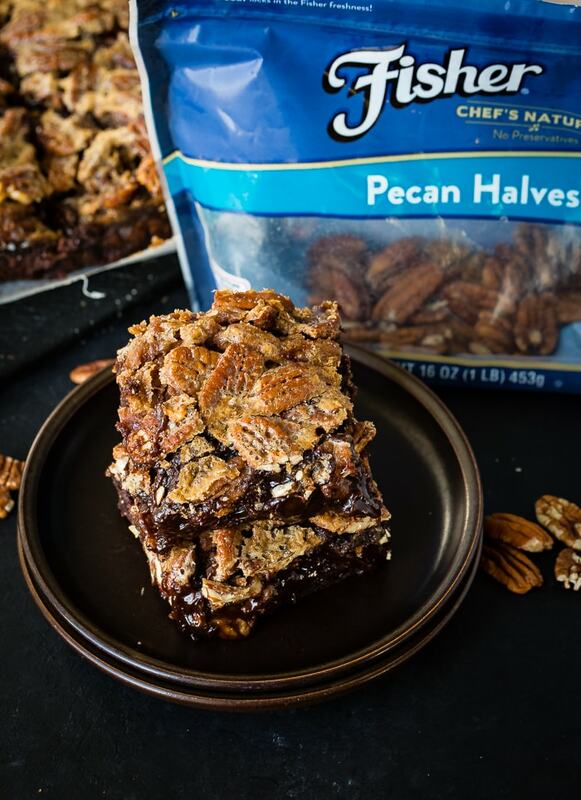 You can store pecan pie brownies on the counter, covered with saran wrap, foil or with a lid. You can also extend the life a little more if you store the brownies in the fridge, also covered. 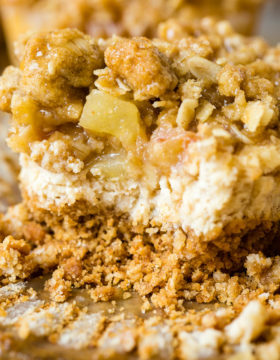 If you’re looking for another indulgent dessert, try this gooey butter cake! Mix your brownies according to the package directions. Pour brownie batter into a greased 13x9 inch pan and place it in the oven to bake for 30 minutes. While the brownies are baking, start on the pecan pie topping. 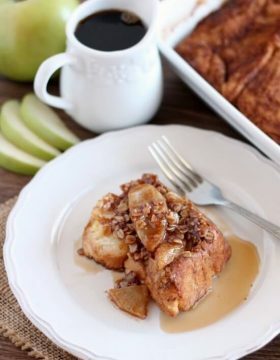 Toast the pecans over medium heat in a skillet for about 2 minutes, stirring often so no burning occurs. 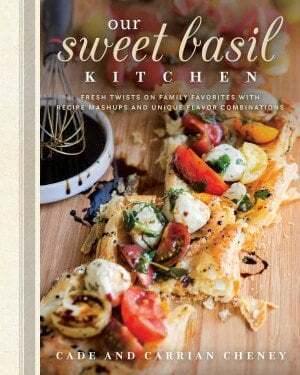 In a large bowl, combine the sugar, corn syrup, eggs, butter, and vanilla, mixing together well. After 30 minutes remove the brownies from the oven and pour the pecan pie filling over them, making sure to not add all of the liquid. Place the brownies back in the oven and bake for 30-40 minutes longer or until the filling only jiggles slightly in the middle when you move the pan. Let cool to room temperature before cutting or the brownies will be too gooey to eat. Is the recipe correct, 2 boxes of Brownie Mix? 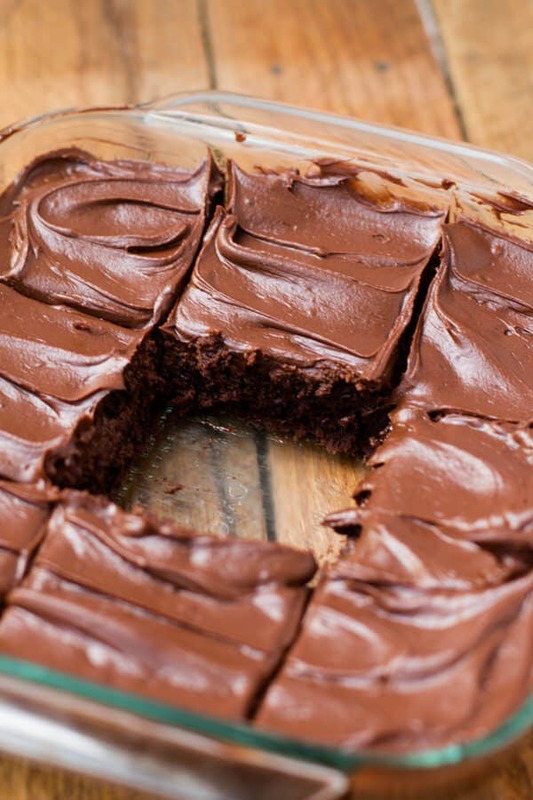 Yes…this makes a 9×13 dish of brownies that are thick and chewy delicious!